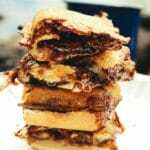 These pie iron breakfast sandwiches are stuffed with nutella and bananas and cooked to perfection over campfire coals. Split the biscuits in half and press one half into each side of the pie iron. Use a knife to add hazelnut spread – about 1/4 cup – and then add sliced banana. Close the pie iron and nestle it into the coals – on an area of even heat if possible.. Cook for 6 minutes, flipping halfway. Carefully remove the sandwich from the pie iron and allow to cool. Enjoy with coffee! You will need a campfire for this recipe. This is non-negotiable. We ordered our pie iron from Amazon for $15-ish bucks!